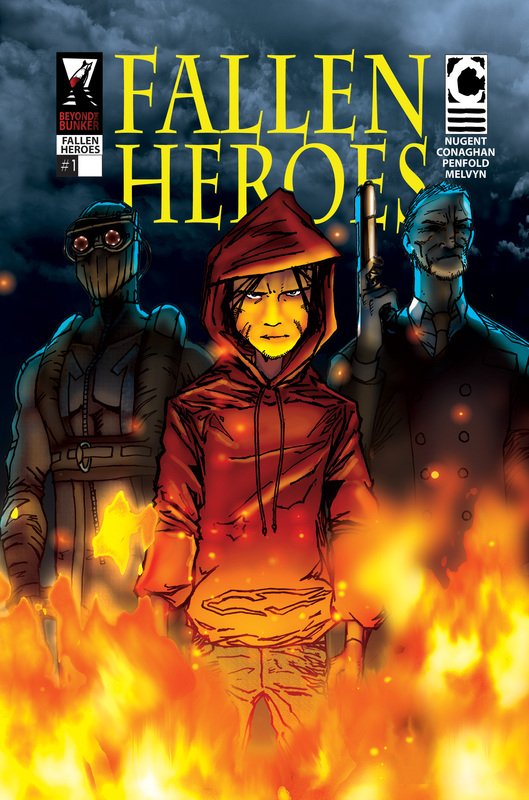 Fallen Heroes are coming to Gosh Comics! With a 24-year track record in the industry and enthusiastic, knowledgeable staff, Gosh! Comics remains London’s must-visit store for those who love the medium. Our range of graphic novels is second to none, and we’re always striving to source new and interesting product, whatever the genre. From translated European albums to mainstream superhero antics; vintage children’s books to contemporary graphic fiction; compulsively readable manga to cutting edge small press: we’ve got something for everyone. Whenever I’m in London one of my fave comic shops to check out is Gosh . It has a great layout, combined with a team of friendly and knowledgeable staff. 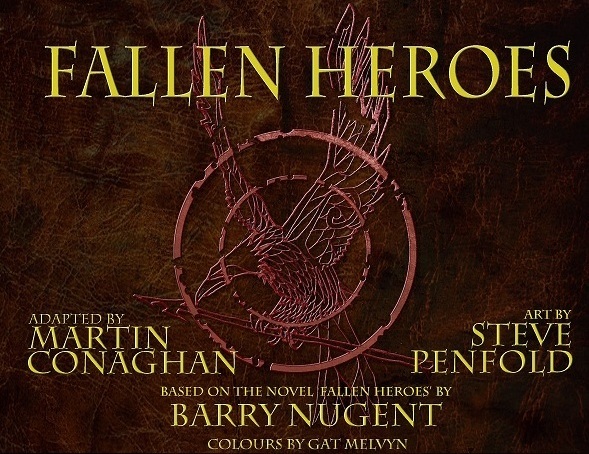 If you’re a visitor to Gosh in the near future you’ll be pleased to know that soon you’ll be able to pick up a copy of Fallen Heroes #1 in-store. The Gosh team have pre-ordered a significant number of copies from our first print run to sell in the shop. Keep an eye out for news of when the comic can be picked up from Gosh. 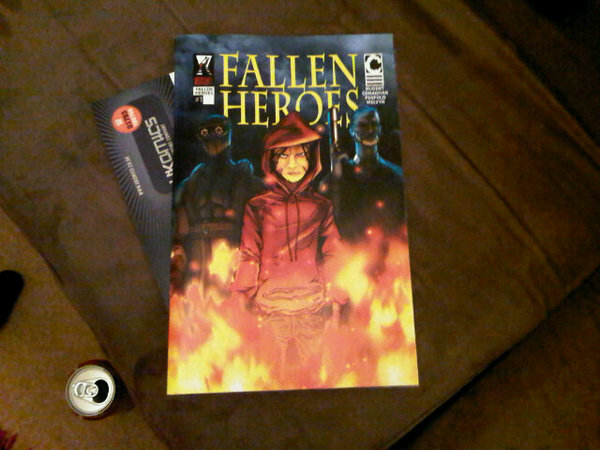 So I was away at last weekend and when I returned I found the proof copy of Fallen Heroes issue 1 waiting for me. It was a pretty indescribable feeling seeing the comic there staring up at me but it’s an image I’ll remember for a lot of years to come. We’re just checking to make sure everything is ok to go ahead with the first print run and the signs are good. The Heroes are almost here! The Heroes are Here – Fallen Heroes Ready for Pre-Order! In case that awesome trailer and brilliant cover didn’t give the game away I can now officially say that Fallen Heroes Issue 1 is complete! It’s been a long road for the creative team and a lot of hair pulling from yours truly at the last minute (which isn’t easy with no hair) but the first issue is complete. Yesterday the finalized pdf was passed over to the guys at ukcomics, who have been a fantastic help, for printing. I’m immensely proud of the amount of time and effort the creative team (Martin, Steve and Gat you guys are fantastic) have poured into hitting the deadline for the project. It’s both weird and fantastic to see scenes that have existed sorely in my head for over ten years there on the page in full colour. Thanks also go out to Paul Mclaren for stepping in at the last minute to help with the lettering also Ian Sharman who worked with Martin to help put the comic together and Anthony Thickitt who helped out with the technical stuff with the ad layout. Also thanks to Dennis Morrison of Zizzl Media for single handedly producing the fantastic launch trailer. Thanks to Emma, Andie and Leigh for supplying and allowing me to use their fantastic interpretations of the characters for pin ups. Thanks to everyone who donated and the ad buyers who made this possible from a financial standpoint. Special thanks are reserved for Nic Wilkinson, of the late and lamented Insomina Publications. It was her idea in the first place to do the comic adaptation and she was the one who put the creative team together. Her boundless enthusiasm for the project made her an absolute blast to work with and really help me to see what was possible. To put it as simply as I can there would be no comic without Nic. Even though she is not officially part of the team anymore as far as I’m concerned she never left it. Thanks for making a long time dream a reality Nic. Apologies if I’ve missed anyone. The next stage, of course, is to sell the bloody thing. A pre-order page has now been created where you can pre-order the first issue. The options are available for you to either have a limited edition copy sent out to you when the comic is released or to reserve a copy and pick it up at the launch at the Cardiff International Comic Expo on Saturday 26th February 2011. Remember we only have 100 copies of the limited edition so if you want to ensure you get your then please pre-order/reserve your copy now. Soon after the launch there will be digital versions available but more details on that soon. If you are interested in a review pdf or further information the please get in contact with us at fhcomic@hotmail.co.uk. It’s been one hell of a journey but the Fallen Heroes are here and I couldn’t be happier. So here we are in our last week to have the comic finished to reach the deadline to have it ready for the printers next week. It’s been a real learning curve for me to be behind the scenes and to see the amount of effort that goes into producing a comic. Hats off to any comic creators out there because blimey there’s a lot of stuff to think of when attempting this. I’m very happy to say that all the pages have now been colored and the lettering should be done by Wednesday. Work is going well on the cover and the final little bits that need to be done before the deadline but with fingers crossed I think we should meet the deadline. Next week to celebrate the comic being finished on time (besides getting drunk) I plan to finally stick the awesome motion trailer up on the website in place of the weekly teaser poster. Trying my best not to get nervous but it’s nigh on impossible. The date to have everything ready for the printers is looming but I’m confident we’ll be ready in time. Steve (Art) and Gat (Colours) are putting the finishing touches on the penultimate page of art and look has started in earnest on the cover. Martin is currently working on two pages of back matter which will include some extra story information and bridge the gap between issue 1 & 2. Thanks to all the people who have either donated or bought ad space in the comic we have now raised enough money to pay for the first print run. We are also planning to have a pre-order scheme with a special price for people either pre-ordering the comic or picking it up on the day from the Cardiff International Comic Expo. More news, teaser posters and a trailer soon! So here’s the second of our six teaser posters for the upcoming issue 1 launch. I’ve now seen 18 pages of art and I know I’m bias but I love every single page of what I’ve seen. It’s blown me away seeing my story translated to the comic form. This was something I never expected to happen. I can’t wait to hold the finish comic in my hands and hopefully that won’t be too long a wait. This is right up there with the first time I walked into Waterstones and saw my book staring back at me on the shelf. Also we now have an awesome motion trailer for the comic which will be launching soon so keep an eye on the website. 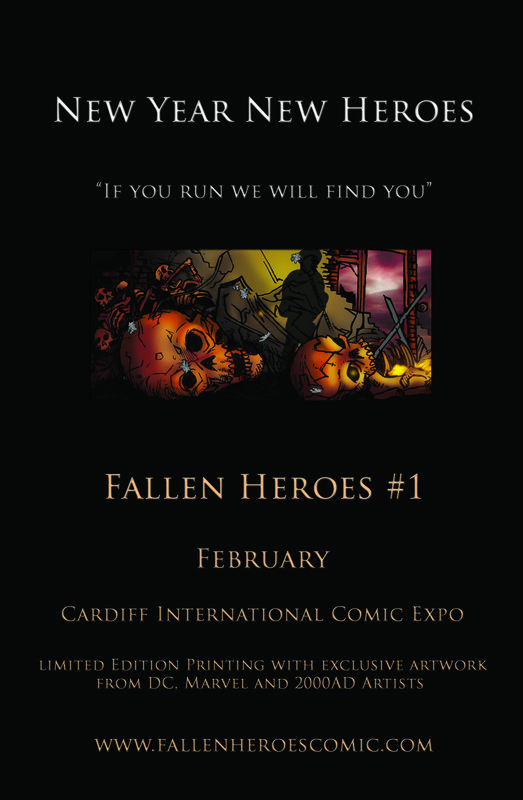 To kick off the new year here’s the first teaser poster for issue one of the comic adaptation of my novel Fallen Heroes. 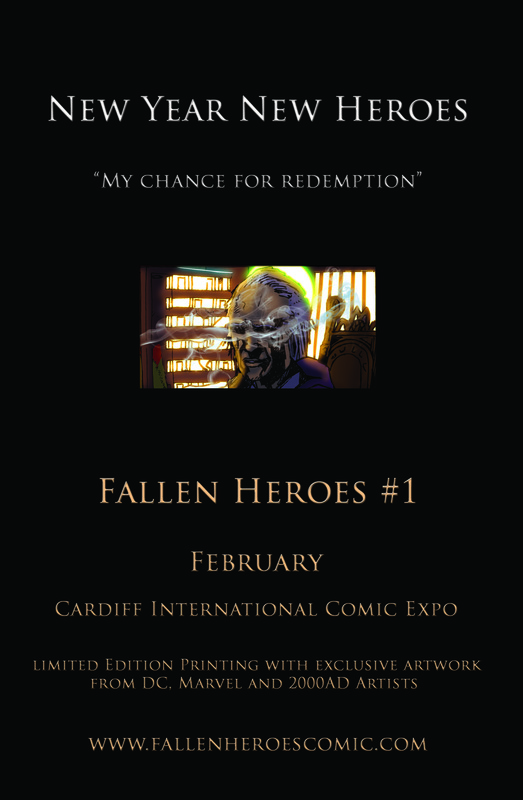 There will be more teasers and info leading up to it’s launch at the Cardiff International Comic Expo in Feburary. 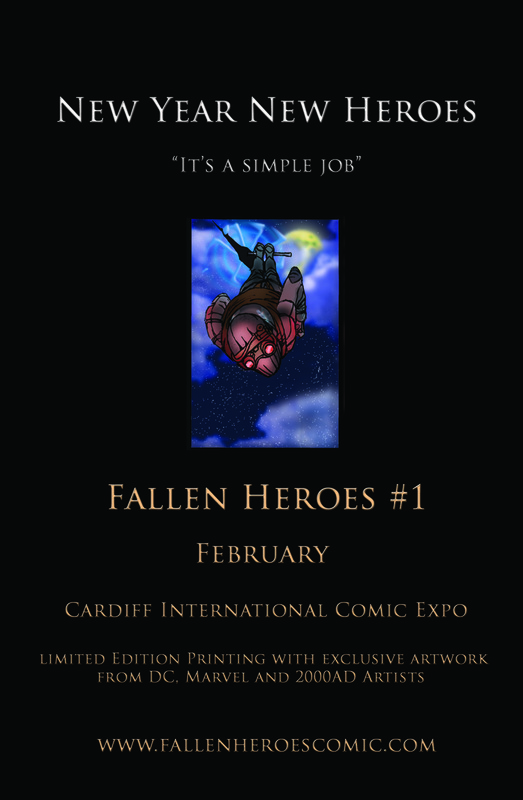 Fallen Heroes the comic adaptation - issue 1 coming Feb 2011 - Pre Order Now!